YA mysteries are quickly becoming a favourite of mine. 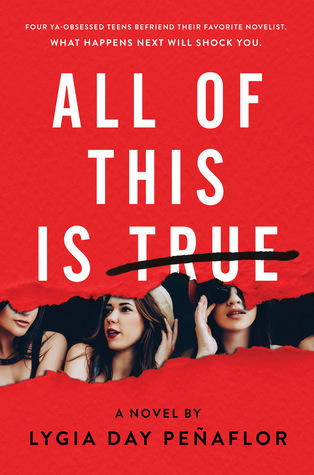 I’ve adored books like One of Us is Lying and Truly Devious, so I was, of course, dying to get my hands on All of This is True. This is the first novel by Peñaflor that I have read, so I wasn’t sure what to expect in terms of style. The format of the novel is quite interesting – the story unfolds through interview transcripts, magazine articles and excerpts of the fictional novel the plot is centred on. It reminded me a little bit of Big Little Lies. Some people might find it off putting; I found it quirky. However, the character voices are a little muddled. I often couldn’t remember who’s interview I was reading – Penny’s or Miri’s? Soleil’s parts were easier to keep track of, but I think that was because unlike the other two girls, her side of the story is told through magazine articles. I think if the characters weren’t so one dimensional, the novel’s format would have been a lot more enjoyable. The plot itself is entertaining, but the twists are few and very predictable. The writing style is good, but mediocre at points. The novel excerpts were the hardest to get through. It was hard to believe this fictional NY Times bestseller author would write so… Amateurishly. How did this Fatima Ro get such a following…? BUT! And it’s a huge, ALL CAPS but – I couldn’t stop reading! Why?, I hear you ask. I’ve asked myself that too. I just had to know. I had to keep reading to find out what the hell happens. When it came for me to put it down and go do some adulting, I just… Couldn’t. I just needed to see the fallout of those plot twists I saw coming, which begs the question… Just what makes a good book? If the plot is meh, if the characters are meh, and the writing is meh, but you can’t stop reading… Is it a good book then? I’m going to say yes. After all, I read it all in a day, pretty much. Buy it, borrow it, skip it? Borrow it. Perfect for: Lovers of YA mysteries and those looking for an easy but entertaining summer read.